Well competed in my first Sanctioned event this past weekend. 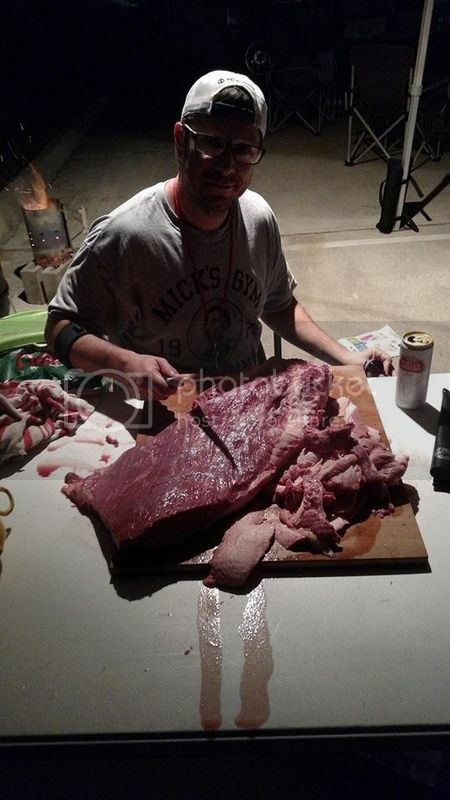 It was the first annual Southern Star Brewery BBQ Cookoff in Conroe, TX sanctioned by Lonestar BBQ Society. It had a field of 27 and I figured it being the first annual at a brewery, I should have a good chance to do pretty well for my first real event. 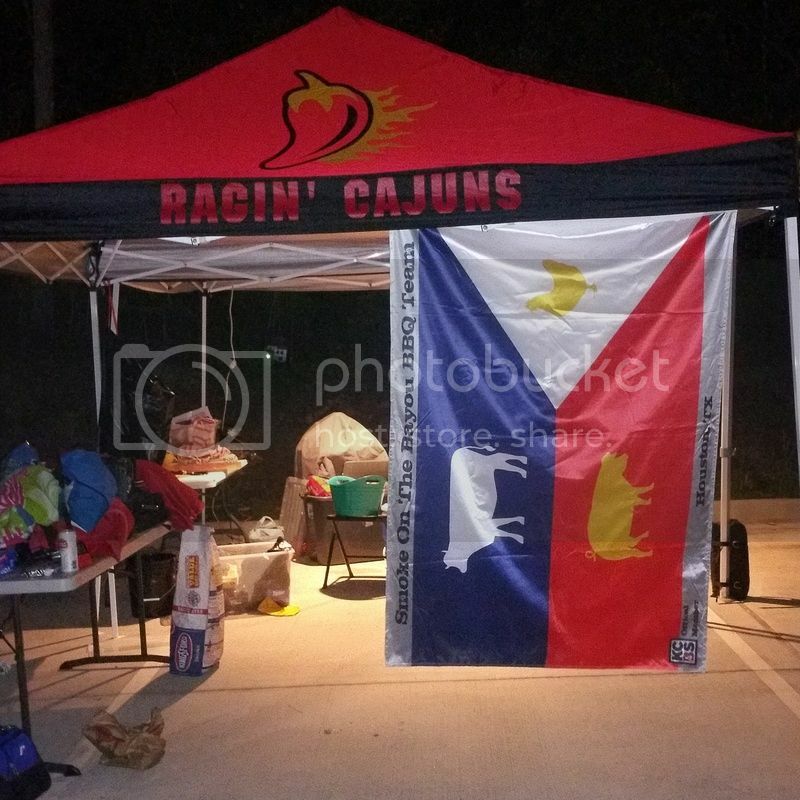 SO I put together a new team with my own logo and all "Smoke On The Bayou BBQ Team", imported a good friend from Louisiana and grabbed another good friend to round out my team of 3. Using my WSM 18.5, my copper kettle, 2 popup tents and 2 folding tables we hit the road an hour north of Humble Tx and got all setup and went to the Cooks meeting. ALL WAS GOOD and hopes were high. I had my schedules and recipes ready and we went to work around 11pm trimming, seasoning and lighting fires. Around 2am im locked in at 271* and the WSM is puffing away on the brisket. A fairly drunk leader of another team stumbles his way over to us and starts chatting. WELLLLLLLL somewhere in this conversation I start to pay attention to him when he says he is here for the instant qualification to some big Kansas City event that goes to the winner of this event. I take my jaw off the ground and shake off the shock as i look around and it sinks in WHY I see so many big money rigs and pits around me. YEP, I put myself in the middle of a competition full of REAL pros. I was setup next door to WarPig bbq, who i later found out competes in the HLSR and has MANY trophies to his name. Even with this realization of what I got us into, I kept on schedule and stayed the plan. It was a great event w/ a pet adoption, bands, beautiful weather once about 10am and I have to admit they make some TASTY beers. I turned in a Half of chicken that was a LITTLE more spicy than i was hoping it would be, but the flavor was AMAZING and we had HIGH hopes for it. NULL ON THE SCOREBOARD. did not make the final table. 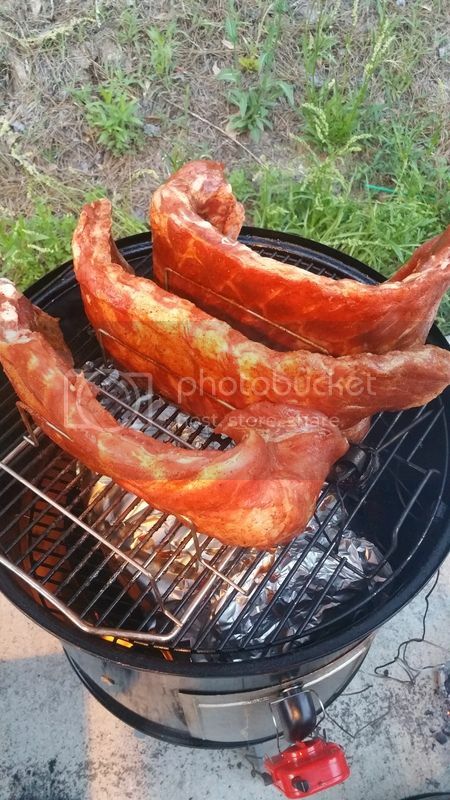 Ribs were next and we put out some DECENT bones that looked pretty good. I am STILL looking for another layer flavor as i feel its a little FLAT, but overall i was satisfied with them. NO final table. So we are 0 for 2. 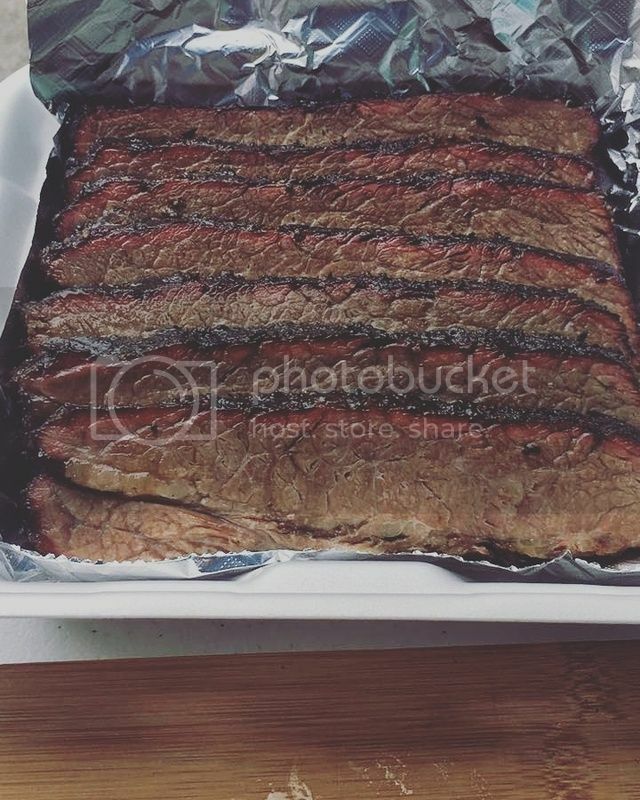 Brisket came out very good. A 16.5lb prime seasoned w/ my usual Breauxly Cow seasoning. It had a good bend, pretty solid bark and the flavor was nice. I had a nice THICK flat which i should have used a little more seasoning on, but once again, VERY satisfied with the brisket.. and what do you know.. MADE THE FINAL TABLE taking 16th. SOO I placed in a ROUGH crowd and we are VERY HAPPY with this. I want to give a huge shoutout to Dennis of WarPig. I am sure he saw the confusion on my face, the ghetto feel of our setup and gave us LOTS of great advise, thoughts, basically the breakdown of how thejudging is done and what needs to be done to win. He let us taste his turn-ins and even gave me a bottle of his FUBAR sauce. 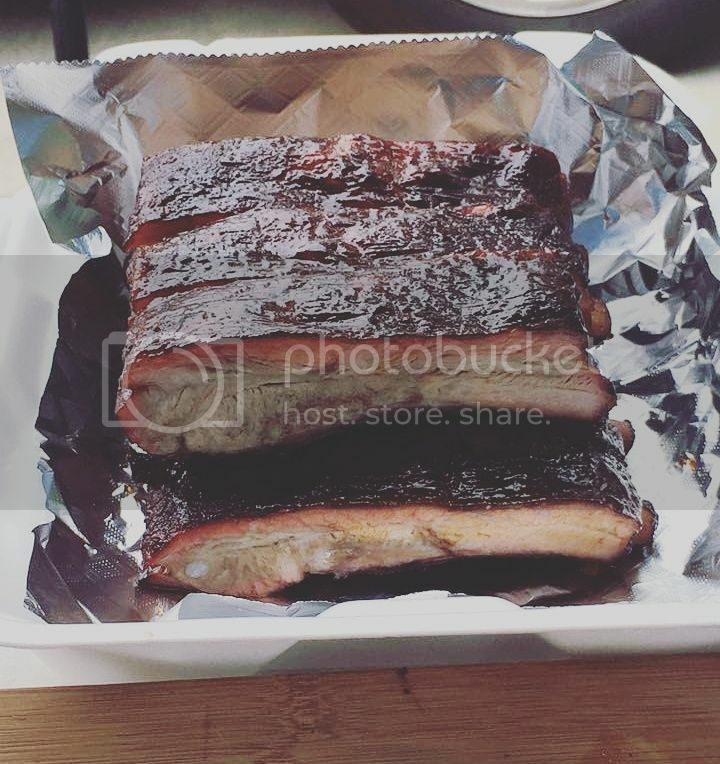 I learned more about competition bbq cooking aside him for a few hours, than i have in the previous 2 years of smoking on my back deck and reading forums and websites. 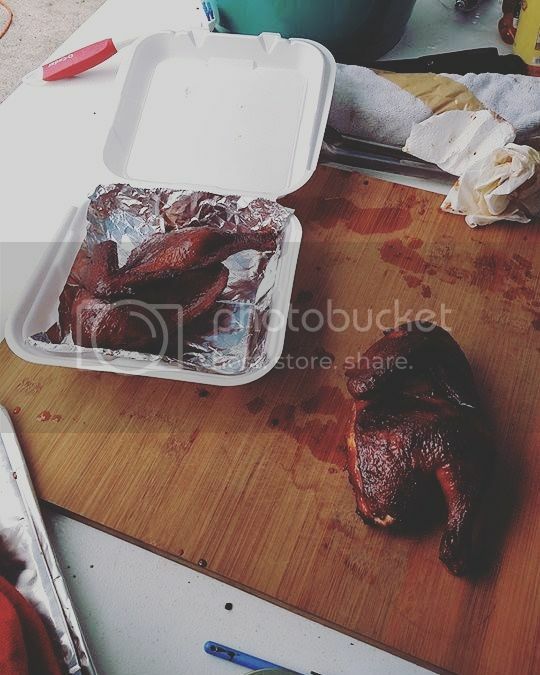 I learned i have ALOT of work to do to actually compete, BUT the Smoke On The Bayou BBQ Team has decided to keep going and we are going to start working on improving and PROBABLY upgrading my Pit and setup. Didnt get MANY pix, but here is what i got. 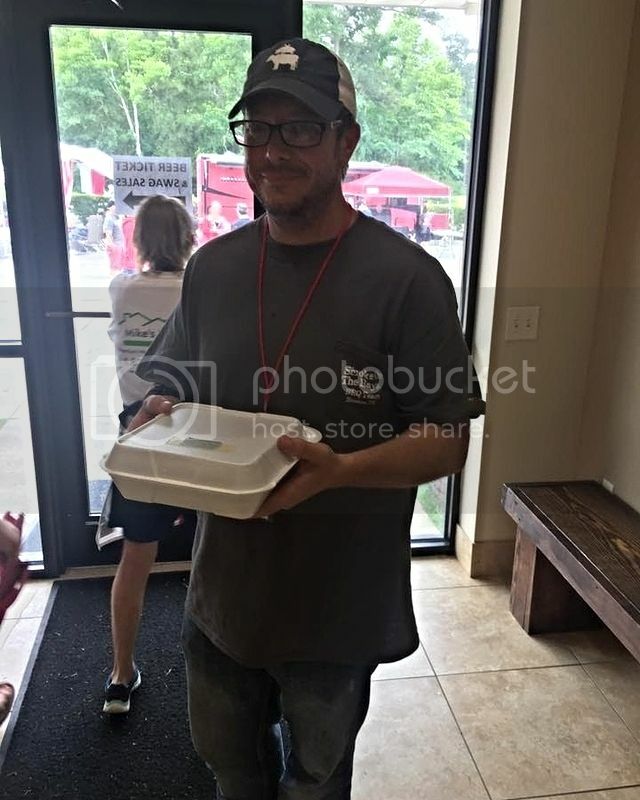 Y"all should be proud food looks great appears that you learned a bunch Congrats to you and your Team for, what I think, was a valiant effort and rewarding Job. "shiny stuff is materialistic - - food friends and fun is Realistic"
OldUsedParts wrote: Y"all should be proud food looks great appears that you learned a bunch Congrats to you and your Team for, what I think, was a valiant effort and rewarding Job. You had fun, learned lots and made the final table on brisket. Sounds like a successful first competition. I'd bet most of those guys with the big shiny rigs had worse results their first go round. Everybody has to start somewhere. We did our first last year. Not sanctioned, but you're not joking about the knife to a gunfight! Congrats on making it past the first table! Come down and cook in Fort Bend with us at the beginning of October! Well done, Sir, the first one is always the toughest cause yer feelin your way round in the dark a bit. Will come naturally soon enough. TX1911 wrote: We did our first last year. Not sanctioned, but you're not joking about the knife to a gunfight! That does not sound like a horrible idea, going to DEFINITELY look into that. Great intro to your weekend and great pics as well. Meat looked pretty darn good to me. Great setup as well rus, only way is up now ! Look forward to your next outing. Nice experience, story, and nice Q.
Congratulations on getting out there and trying they get easier as they go for sure. Butters is a great guy no doubt about it and always willing to help a new team I will see him this weekend in Port neches.